Some of the foods we eat in Costa Rica. It's amazing how quickly two weeks can go by without posting a new entry. A friend of ours had a great idea and put together a compilation of photos of many different types of fruits and vegetables that are commonly found at the farmers market we go to each Saturday. She's allowed me to borrow the pics and we hope you enjoy "seeing" a little bit more of what we are eating down here!! In some latin countries they call this one pomarosa, but the ticos (the name for the native Costa Ricans) call it manzana which means apple. It tastes kind of like an apple, but is the texture of a ripe pear....it tastes pretty good, especially when it's very red in color and eaten cold. This is guanabana. This is another one of our favorites. Our neighbors, the Whittakers, introduced us to this one. It is a very large fruit and is commonly sold in pieces. We bought a blender a few weeks ago and the first thing I made in it was some guanabana juice. Oh the glory of the mango! Jim and I eat mangoes almost every day. The mangoes in Costa Rica are large, juicy, and delicious! There are many ways to prepare mangoes (I even made some mango cobbler the other day!) , but we mostly eat them fresh...they are just that good! Here's an interesting one. This is called zapote. The ticos love it but, the texture was a little too soft for me. They say it is related to the avocado, but it tastes and looks like a sweet potato. This is a guava (guayaba in Spanish). And it has been a favorite of my neighbor's since she was a little girl. The guava juice is very good and healthy. These are quenepas (the ticos call it mamon). Jim actually tried these in the States once as a friend of ours from Puerto Rico had some sent to her. They're nice and sweet and fun to snack on. The ticos call this one mamon chino. We bought a bag of these at the market last week. They look similar to lychee, but taste very similar to a grape. This is cas. It looks like a guava. It smells like a guava. But it is not a guava. The ticos make a juice out of it and add a ton of sugar to it. This fruit is called tamarindo and if you like Thai food (like me) this is one of their secret, but not so secret, ingredient. I've only ever bought pre-packaged and have yet to buy the real deal...maybe this next week?! Another amazing-juice-making-fruit. Passion fruit is the favorite among many latinos (says my puerto rican neighbor). I know you can guess the name of this one. This is the star fruit and it is very tangy and used in salads here in Costa Rica. Everyone knows what this is called. Though you may not realize it, I'm sure you're called it by it's spanish name before if you've ever asked for a piña colada! The piñas here are sweet and juice and they grow very big. The farmers market sells fresh coconut drinks for about $0.45 each. I bought my first one 2 weeks ago...however, rather than drinking the water I took it home and (with the help of my neighbor) got the husk off and made homemade coconut milk. Admittedly, it wasn't quite as creamy as the canned stuff, but it was fun to try! Costa Rica also has papayas. They grow huge and many say they are delicious. We know someone with a good recipe for a papaya sauce to go with baked chicken...I'll have to try it sometime soon and let you know what we think. This is calabaza squash. It is related to the pumpkin but not as sweet. I used it for the first time last night in a puerto rican rice and beans dish that my neighbor taught me to make and it was delicious! I will definitely be purchasing this again. Green or yellow, plantains are starting to become a staple in our home. Which is good, since plantains and bananas are one of the top produce grown in Ecuador. You can eat them in so many ways. When they are green, they are more like potatoes and when they're super ripe you can fry them up for a sweet accompaniment to many latin dishes. I was introduced to these a couple weeks ago. They are called hearts of palm. They are great in salads. These are called chayote. They are a type of squash. You can boil them, fry them, or make them into a stew. They are kind of bland, but they are very common around here. Chile dulce or sweet pepper. They are used in practically every recipe here and also in salads. It is similar to the green pepper in the states but sweeter. These are caribbean scotch bonnet peppers. I know, they have a very long name. They are a little hot and are used to add flavor to everything that it touches. Just don’t eat the seeds. Last Sunday I made the mistake of adding the entire pepper (seeds included) into a typical costa rican dish called Pocadillo and Jim and I had to get creative to find ways of eating it...way too spicy! Here in Costa Rica they call this culantro largo. It is similar to cilantro and is a great addition to almost any dish. So GOOD! Of course, we can’t forget the one ingredient in every latin dish, cilantro. Also called culantro. It is found everywhere, sold in huge bunches, and very affordable. And this what a typical Costa Rican lunch looks like. They call this dish a casado. It consists of rice, beans, stew chayote (called picadillo), salad, and some meat or fish. It is sold in most restaurants and small lunch cafes (also called sodas) and it costs about $3.00 for the whole thing. If you don’t mind eating the same thing every day then this makes a very inexpensive way to surviving in Costa Rica. We hope you enjoyed these pics and that you have a great week! It's interesting being in school again. Being married and having a child changes the dynamics of being a 'student.' My stage in life, my motivation, and purpose for being in school are all a bit different than what they've been previously. But one thing is very similar to past experiences: we still have tests. I'm taking three different courses and there are tests given in each of them. Fortunately, the teachers all coordinate with one another, so we know that every other Friday all the students at the school will be having a grammar test, regardless of the teacher or class level. I had two tests this past week. But testing, too, is different. I remember cramming the night before some tests in high school, then taking the test the next day and with a sigh of relief, thinking I'd never have to use the information I was just tested on ever again. But my attitude here is quite different. First of all, I'm not studying spanish to get a good grade. Granted, I want to get good grades-- but more than that, I want to learn to speak what I'm learning. It's hard, though, taking the head knowledge and transferring it to come out of your mouth. I can learn a formula in spanish for shortening sentences, but if I can't apply that formula to my speaking, have I truly learned it? Therein lies the rub. I'm an exemplary student. I've gotten A's on all of my tests thus far, I always get my assignments done, and I can respond to just about any question in class with a pretty good answer. But at this point I'm not able to walk up to someone on the street or at church and hold a conversation confidently. Should I be able to after formally studying spanish for a month and a half? I don't know. Technically, I've 'learned' enough grammar, vocabulary, and sentence structure to be able to communicate. The problem is, learning it in my head isn't quite the same as learning it well enough to communicate. At the same time I realize I need to have grace for myself. This topic of testing has been percolating in my mind for the past weeks. It's interesting how this parallels our spiritual lives. You can attend church, go to Bible studies, and answer questions correctly in Sunday morning classes, but if you're not taking what you're learning from God's word and living it outside of the church, are you really truly 'learning' it? Are you an exemplary student (like me) that earns A's 'for church?' It makes me think of a Sunday school kid who can answer every question of their teacher about loving their neighbor and showing God's love and then shoves their little brother to the ground in the parking lot before going home. Life isn't easy. It's easy to live it as a passenger or consumer, but trying times will come and we'll always have a choice in how we respond. Do we simply let it happen and as a result be overcome, bulldozed by our circumstances, left crushed? Or do we choose to face our circumstances with Christ in mind, falling back on the faith that has been cultivated over the years as we've applied the 'learning' that we've received. When real testing comes, the easier times of testing and relying on God will act as the foundation for how we will respond to greater times of difficulty. So I realize that the tests my teachers give me matter, but they're only there to prepare me for the 'real' test-- speaking with others on a regular basis in a spanish-speaking country. And how I prepare for these tests will really determine how I'll fare when I'm thrown into daily life in Ecuador. I need to put forth full effort now to transfer my head knowledge to my mouth. There must be implementation: from the textbooks to my mouth, and from God's word to our lives. And as we build that solid foundation in the small things we will be like the house mentioned in Matthew 7:25, "the rain descended, the floods came, and the winds blew and beat on that house; and it did not fall, for it was founded on the rock." Pray with us as we are tested in spanish. We desire to have success and stand when the hard tests come. And know that we're praying the same for you as the tests of life come your way. May God help us to prepare now when things aren't as difficult so that we may stand boldly in His name when the hard times come. the miscellaneous musings of a mama missionary. There's been a lot of different things on my mind lately. I thought today I might take a minute to collect all of them here in one spot....a sort of hodgepodge collection of my observations, thoughts, musings, etc...over the past couple weeks. They are listed below in no particular order. 1. I planned to make pot roast for dinner last night (yes, pot roast in Costa Rica!) We were so excited to have a big beefy dinner, but it turns out it wasn't even close to being done by the time we needed to eat. You see, we had invited our our neighbors over to play games. Plan B - chocolate chip cookies (yes, chocolate chip cookies in Costa Rica! What a TREAT!)! It was a truly "american" meal for us last night. We also ate some leftovers with the chocolate chip cookies. And yes, we shared some cookies with our neighbors. And don't worry, the pot roast was not wasted. We are having it today for lunch. 2. While getting ready to prepare 'said' pot roast (see above), I realized I needed to run to the store to get beef stock. With Kaia in tow (in our stroller) I headed to the supermarket while Jim finished his homework. On the way we passed by an old man, probably in his mid 70's who was working as a security guard in front of someone's house. There was an old bicycle next to the security 'hut' that he was trying to fix. Next to the bike on the sidewalk there was a grease stained towel filled with hundreds and hundreds of screws, nuts, bolts, etc...As I walked by I noticed the care and attention he gave to each and every bolt as he looked through the pile to find the right one he needed. Although I am ordinarily an observant person, I was particularly struck by the patience, beauty, and ease in which this man slowly put together his bike. I continued to think about him until I arrived at the store and then quickly forgot as my shopping list took over the recesses of my brain. 3. 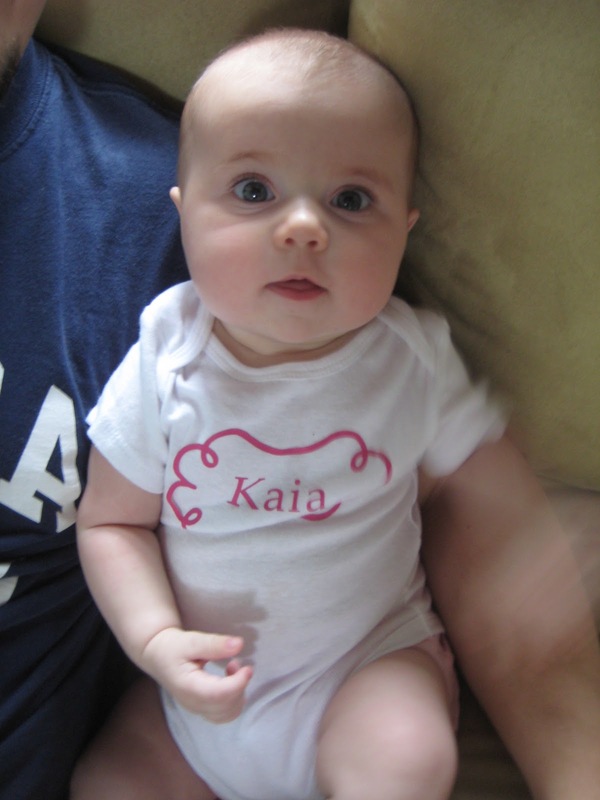 As many of you have seen through photos and videos, Kaia is starting to grow up pretty quickly. So many mothers and fathers have told us to enjoy her while she is a baby because this stage goes by SO quickly. However, in the first three months I can honestly say that I didn't quite get that feeling of urgency. Not until this week. Now she is 4 months old and has finally grown into a new size of clothes. She arches her back and rolls to her side and then brings her legs forward, pushes on them and then lays on her back again - successfully completing a 45 degree rotation in her play yard. She has successfully sat on her own for 7 whole seconds and wants to practice standing all the time. Already I feel like she is cooing at me so "matter of factly"...(you know how little girls can be so "matter of fact"). But beyond that she has started to pick up her toys with ease and grace; she is so much more confident in her hand-eye coordination. There's just something so grown up about having good hand-eye coordination. It's like she's reached stage 2 of her existence. From here on out we imagine it's going to be a roller coaster of a ride and we are going to do our best to enjoy absolutely every second we have with her! 4. I'm reading a book called "The Gospel According to Jesus: Living a life of authentic faith". It's been a great read so far and I've been really challenged to consider what it means to be a true worshipper of God. The book introduces the word "doulos" which means slave. According to this book there are several places in the English translations of the New Testament where the word "servant" is substituted and used instead of "slave" when "doulos" is used in the original text. The difference between being a servant to Christ and a slave of Christ are actually quite significant. As a servant, I am choosing to serve on my own accord. There is room for arrogance and boasting with service because I have ownership of the decision to choose to serve. However, when I am a slave I am serving my Lord and Master who has all control of my life. In order for me to be a true worshipper I need to confess the reality of my sin (no sugar coating or making excuses) and enslave myself to THE Lord of my life...with all that I am. It's one thing to say that and an entirely different thing to actually live it. 5. One of the things that I really love about Costa Rican culture is that they love, love, love, lovE, LOVE, LOVE, babies and children. Everywhere we go with Kaia she is greeted with smiles, hugs, laughs, and people talking with her. It's not just Kaia...I've seen them do this with ALL babies. I remember when Kaia was born how lifted up in prayer we felt and how there were literally hundreds of people that truly love and pray for her. I have thanked God continually for this and now we arrive in Costa Rica and there's a whole country that loves her! She truly is a blessed little nina!! Anyway, I had an experience last Friday that I think sums up Costa Rica's love for children. I needed to take Kaia to the doctor in downtown San Jose, which required me to take a public bus for about a 20 minute ride. I decided to keep the stroller at home and take her in the Ergo carrier. Admittedly, I was feeling the tiniest bit nervous about going on my own and venturing into the spanish speaking medical world on my own. It turns out I was getting on the bus right at the height of commuter traffic. The bus was packed when I got on. The entire middle aisle was filled with people standing. This was the first time I had seen so many people on one bus here. After paying the bus driver I walked one step forward before running into the mass of people. I was a soccer player in college and was somewhat confident that I'd be able to carry both Kaia and I for the duration of the bus ride...but then I happened to make eye contact with 5 different individuals, all of whom were on the verge of getting up from their seats...just then the bus driver called out to ask, "Who's going to give up their seat for this mother and baby?!" Immediately a seat was offered. What strikes me about this is that Kaia and I are clearly not Costa Rican. We are foreigners and there are plenty of places around the world that would pay no attention to us just for that reason. How many countries have you been to where a public bus driver takes the initiative to look out for his children passengers? I was touched and grateful for the seat as the ride ended up being about 30 minutes due to traffic. Just one of the many ways God continues to take care of us in Costa Rica. Ok, hope you enjoyed these miscellaneous musings from a mama missionary. Tune in next week for more updates!